February 26, 2016 – Today’s history author, Matthew Hart, brings us…gold. No, he’s not making us rich. 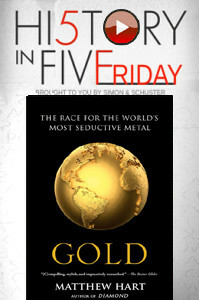 It’s the title of his latest book: Gold: the Race for the World’s Most Seductive Metal . It follows in the footsteps of his previous book: Diamond – The History of a Cold-Blooded Love Affair . It’s the perfect way to kick off your modern weekend…with people from the past.